Properties in Picayune average 4.7 out of 5 stars. Welcome to “ParaPlace J”! Quaint, cozy and new! Property 1: Welcome to “ParaPlace J”! Quaint, cozy and new! New, Cozy “ParaPlace” 45 minutes to New Orleans, LA and Gulf Coast of MS! Property 2: New, Cozy “ParaPlace” 45 minutes to New Orleans, LA and Gulf Coast of MS! Large Acadian Style Home / 2100 sq ft.
Property 5: Large Acadian Style Home / 2100 sq ft.
Property 7: Cottage Charm - Peaceful Setting - Beautiful Bayou View & Retreat! 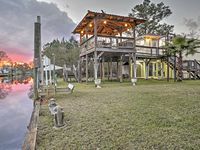 Bay St Louis House w/ Deck on Breath Bayou River! 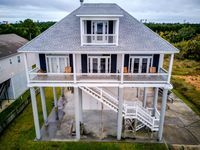 Property 8: Bay St Louis House w/ Deck on Breath Bayou River! Property 9: Fishing, Boating, Relaxing, 15 Min Boat Ride To Open Water, 15 Drive To Town. Waterfront! Fish, Boat, BBQ, Relax!! Book Now! Property 10: Waterfront! Fish, Boat, BBQ, Relax!! Book Now! Jordan River Skiing/Fishing Vacation House - Snowbirds Welcome. Property 11: Jordan River Skiing/Fishing Vacation House - Snowbirds Welcome. Quiet, Waterfront House with Boat Access Near Jourdan River! Property 12: Quiet, Waterfront House with Boat Access Near Jourdan River! Beautiful upstairs condo with a pool view. Property 14: Beautiful upstairs condo with a pool view. Come To The Mississippi Gulf Coast For A Great Time! Property 19: Come To The Mississippi Gulf Coast For A Great Time! New Orleans 45 minutes away!! Enjoy the beach too! Property 23: New Orleans 45 minutes away!! Enjoy the beach too! Beautiful, Two-story House On The Water With 150' Private Pier! Property 24: Beautiful, Two-story House On The Water With 150' Private Pier! Save Now! No Cleaning Fees! Adorable, Affordable and Serene, Couples Delight! Property 26: Save Now! No Cleaning Fees! Adorable, Affordable and Serene, Couples Delight! Property 33: Your escape to Golfing Paradise or just Relaxation, your can have it all here. Boaters Delight!!! This camp style vacation home sits on a deep canal! Property 36: Boaters Delight!!! This camp style vacation home sits on a deep canal! Property 45: Mardi Gras Season Is Here! 3b/1.5ba Rental Home Available in Quiet Subdivision!! NEW! Waterfront Bay St. Louis Home w/ Pool & Dock! Property 46: NEW! Waterfront Bay St. Louis Home w/ Pool & Dock! Relaxing very nice home away from home! The house was very cozy and clean. We felt so comfortable as soon as we walked in. The kitchen was nicely equipped with a nice gas stove and a big refrigerator. There were more than enough clean towels in the bathroom. Our favorite was the patio. No houses right next to or in front. We will definitely come back to stay again. Spacious house with breathtaking views across Bay St Louis! This spacious 4 bedroom house has views to die for, owing to its position and elevation. The sunsets are incredible and I believe the sunrises are too (although we were never up in time to see them!). Very comfortable beds and living room furniture and a wonderful open fireplace that I imagine is perfect on a cold Winter&rsquo;s evening. A delightful 2 mile drive or bike ride from Main St in Bay St. Louis, which is a fantastic town full of art and craft shops, great cafes and small town charm. And a wonderful long, empty beach, great for walking, or beach volleyball, or just lazing around, sunbathing. One of our favorite spots to visit!